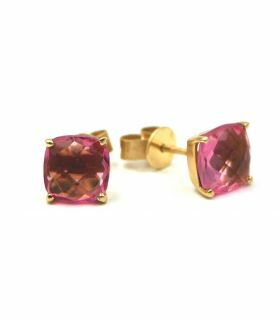 Rose Gold plated 925 Sterling Silver stud earrings with a pink coloured stone. The quartz stone is square shaped and is held by a four legged claw. Push back closure. Size: 0.7cm x 0.7cm. Hook 925 Sterling Silver earrings with a natural pearl and finish in 18K Yellow Gold plated. Earrings size: 2.5 cm. Long 925 Sterling Silver earrings in a Rose Gold finish. Attractive design with zirconia stones in two colours and different shapes. Push back closure. Earrings length: 4.5 cm. Beautiful carved Tree of Life pendant necklace in 925 Sterling Silver rhodium-plated with the tree leaves in coloured zirconia stones. The Tree of Life pendant includes a 50cm Singapore style chain. Size: 1.9 cm wide x 2.2 cm high. 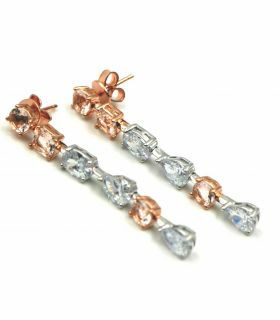 Cute 925 Sterling Silver earrings in a Rose Gold finish with two white zirconia stones flowers of different sizes joined by bar. Push back closure. Earrings length: 2 cm. 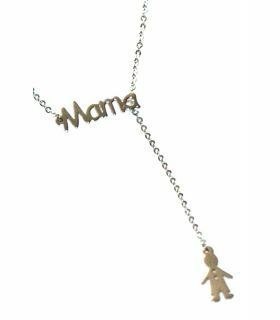 18K Yellow Gold Silver choker necklace with personalized name of 10 mm. Fitted with a snap clasp. Specify the name you required when placing your order. Name choker ready for shipping in 48 hours. Gold plated Sterling Silver custom personalized bar bracelet with free engraving. 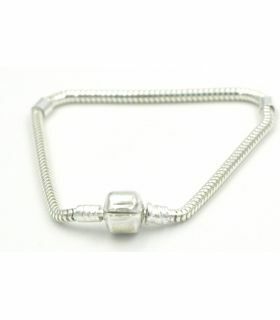 Bar bracelet size: 39 mm x 35mm The bracelet is 18 cm long. Bracelet ready for shipping in 48 hours. Sterling Silver custom personalized bar bracelet with free engraving. 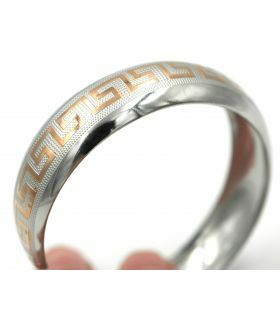 Bar bracelet size: 39 mm x 35mm The bracelet is 18 cm long. Bracelet ready for shipping in 48 hours. Rhodium-plated Sterling Silver dangle earrings in an attractive white zirconia Riviere style design that finishes in a teardrop shape with a zirconia in the centre. The earrings are 3cm long. Push back closure. 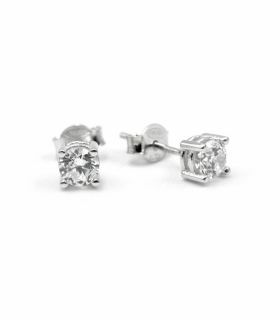 18K Carat White Gold stud earrings with a bright cubic zirconia stone held by a 4-legged claw Diameter approx. 5mm Push back closure. Free delivery. 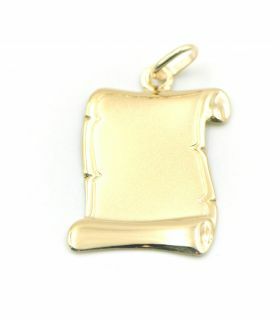 Medium sized 18K Yellow Gold parchment Pendant suitable for engraving. Matt and polished finish. Size: 2.2 cm by 1.5 cm. Free engraving. Free delivery. Caravaca Crucifix Cross pendant in 925 Sterling Silver with a 50 cm Silver chain. Crucifix Cross size: 2.3 cm. Choker necklace in 18K (Carats) Yellow Gold with a flower encrusted with zirconia stones and 42 cm gold chain. Minimalist style. Free delivery. Hook Sterling Silver earrings with a high quality natural Turquoise stone. Size: 3cm long x 1.2cm wide approx. Romantic half moon pendant. Manufactured in 925 Sterling Silver with a white mother-of-pearl moon. Moon size: 2.8 cm x 2.8 cm. The pendant is accompanied by a 50cm long by 0.25mm thick Silver chain. Adjustable Sterling Silver ring with a natural Malachite stone cabuchon. Hand made. Malachite stone size: 22 X 17 mm. Sterling Silver 925 anklet with crystal stones in different colours. Snap clasp closure. Size: 24cm long. Long Sterling Silver earrings with an openwork heart design and a long chain with a small rod at the end. Earrings total length: 6.4cm. Heart size: 1.2 cm x 1.2 cm. Push back closure. Sterling Silver hook earrings with a faceted teardrop shaped ruby natural stone. 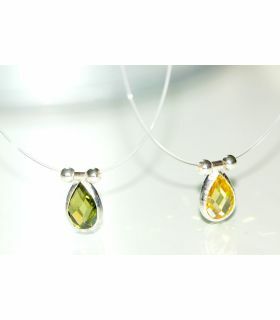 Total earrings length: 3.5 cm (stone´s size 2cm x 1,3cm wide). Ruby is the stone for the month of July. Sterling Silver 925 climber earrings with 7 white zirconia stones. Size: 24mm. Hand of Fatima 18K Yellow Gold Pendant. The Hand of Fatima is enameled with a Turkish Eye in different colours on both sides of the pendant. The Hand of Fatima wards off evil and protects the owner. Hand dimensions: 2.5 cm long by 2.1 cm wide. The Pendant can be supplied with or without a Gold chain. Small oval shaped stud earrings in Sterling Silver with natural Moon Stone cabuchon. Earrings size: 10 mm long x 8 mm wide. We have a full set with matching ring and bracelet. Sterling Silver earrings with a lovely Marcasite border design and a Mother of Pearl stone in the centre. Colours available: black or red. Size: 1.3 cm x 1.3cm. Push back closure. Sterling Silver and natural Moonstone ring. Moonstone size: 2cm long x 1.5cm wide. Available size: 19. If you require other sizes, please contact us. Moonstone is considered to be an amulet of protection, it has a deep feminine energy that knows how to heal. It is strongly connected to moon and to intuition. Sterling Silver minimal Karma Circle design bracelet in a Gold plated finish. Bracelet is 21cm long: (18cm + 3cm extension chain). 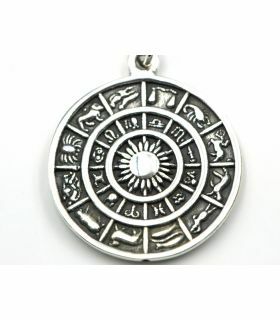 Circle diameter:7mm The circle is the symbol for positive, love, eternity, protection, inclusion. 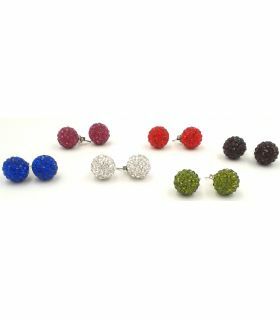 An easy to wear pair of stud Sterling Silver earrings with crystal ball of 12 mm. Push back closure. 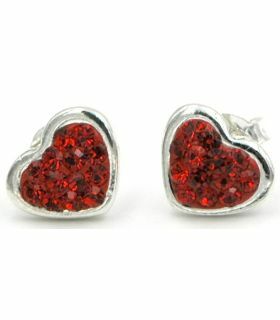 Heart-shaped miniature earrings with Swarovski crystals in passion red and a border in 925 Sterling Silver. 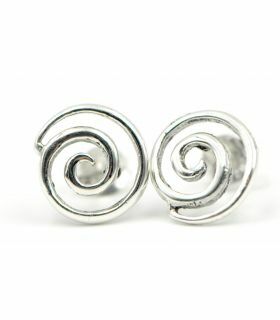 Size of earrings: 7x9mm. Push back closure. 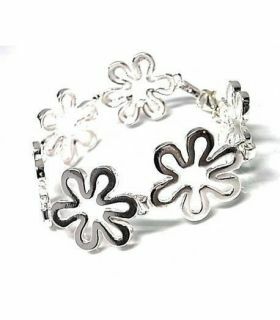 A very fashionable Sterling Silver flexible bracelet for you to wear your favourite charms. Size: 3 mm x 19cm long. Fashion Calamar Gigante has brought for you a very attractive and luxurious crystal stone adjustable ring in a rhodium finish. It is a Kaytie Wu design. 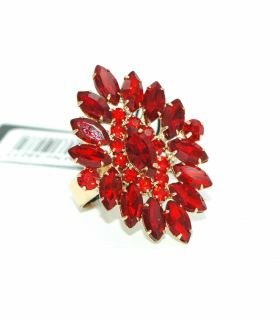 It features a large collection of high quality glass stones in bright red. Alloy metal and gold tone finish. A unique and very unusual alloy stud earrings in a knot design, resembling a flower style, with a gold plated finish. The enamel has been carefully hand painted to make a good contrast. Size: 1.8 x 1.8 cm approx.